The evidence is overwhelming: Low-cost index funds will almost certainly give you the best returns, but the proper asset class matters just as much. Here are the best funds for your 401(k), depending on how close you are to retiring. The 401(k) is a key retirement savings vehicle for millions of Americans. And with a variety of benefits, including tax benefits and employer matching funds, there's almost no reason not to be contributing to yours. But at the same time, it's critically important that you make the best investment choices with your contributions or you could end up falling short of your retirement savings goals in the future. But which funds are best? Generally speaking, low-cost index funds. These kinds of funds give broad exposure to a wide range of companies and with lower fees than actively managed funds (which rarely offer better returns). Let's take a closer look at several funds that are ideal for your 401(k), as well as what to look for when choosing from the funds available to you. Over the past several decades, the evidence has become overwhelming that in general, actively managed mutual funds rarely generate better returns than their benchmarks. Consider the long-term goal of saving for retirement to maximize your returns, it's also generally best to avoid actively managed funds and instead invest in low-cost index funds that track the benchmark index itself. While this won't generate index-beating returns, you'll have about a 90% chance of outperforming any actively managed fund over the long term, in most fund categories. One of the key reasons: fees. The average actively managed fund charges around 0.5% per year in fees, while many index funds charge 0.2% per year or even less. To put it another way, the average actively managed fund charges nearly three times more than the average index fund and nearly always for lower returns. As you can see, stocks (Vanguard Total Stock Market Index Fund Investor Shares (NASDAQMUTFUND:VTSMX) and Vanguard 500 Index Fund Investor Class (NASDAQMUTFUND:VFINX)) have been by far the most volatile but also delivered the best long-term growth, followed by less volatile but still income-delivering bonds (Vanguard Long-Term Treasury Fund Investor Shares (NASDAQMUTFUND:VUSTX) and Vanguard Total Bond Market Index Fund Investor Shares (NASDAQMUTFUND:VBMFX)). Money markets (Vanguard Prime Money Market Fund Investor Shares (NMM:VMMXX) ) have been stable but actually trailed inflation in spending power growth. 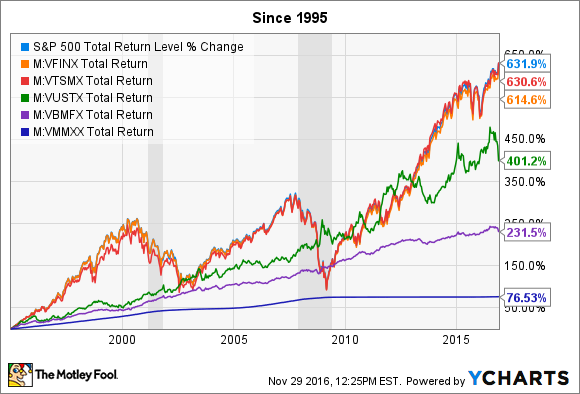 For most individuals, a S&P 500 and/or total stock market index fund are ideal to serve as the foundation of your 401(k), since they track a very broad cross-section of U.S.-based stocks (the Dow Jones total stock market index and S&P 500). This means you'll have a broadly diversified portfolio right from the start, reducing risk of outsize exposure to individual industries or companies. This is true whether you're a few years or decades away from retirement, since even someone in their 60s should have some long-term growth goals. The difference is largely how much exposure you should have to stocks for growing your nest egg, versus bonds for income and capital preservation, and money markets/cash for short-term liquidity. Bottom line: Short-term volatility can be very bad if you'll need the money in the short term, but a very good thing if you're years or decades away from needing it. In short, this is asset allocation, with more of your assets in stocks the farther you are from retirement. The Vanguard funds above not available to you? Don't fret. Chances are, your 401(k) still offers similar funds from another fund manager. And while they may not be as cheap as Vanguard, which charges as little as 0.05% per year for some fund classes -- that's only $0.50 per $1,000 invested -- you'll still likely be able to invest in a similar index fund for far less than an actively managed mutual fund that would deliver worse returns anyway. What about target date funds? Target date funds, on paper, sound like they should be ideal. All you have to do is pick a fund with a date that's close to your retirement, and the fund managers will take care of asset allocation over time. But are they good or bad? In short, the same rule of thumb applies: Index funds tend to generate better returns and charge lower fees than actively managed funds. So before you just pick a "set it and forget it" target date fund, make sure you know what that fund invests in and the fees you'll pay. If a target date fund invests in expensive actively managed stock funds, it's likely to suffer the same underperformance as any other actively managed fund, leaving you with less money saved for retirement than if you had invested in index funds and simply managed asset allocation yourself. Considering that it only takes about 30 minutes once per year to adjust your contributions and rebalance your portfolio, it's not worth picking a subpar target date fund if that's all your 401(k) offers. Invest in the proper balance of stocks, bonds, and cash, based on how long before you retire. Low-cost index funds overwhelmingly deliver better returns than more expensive actively managed funds. Invest in good markets and bad, practicing asset allocation once per year. Volatility is your friend if you allocate appropriately based on your retirement date and not what the market is doing. If you follow these three guidelines, you'll be far more likely to achieve your retirement savings goals.